RUDE BWOYZ FAREWELL FREE PARTY!! upfront drum'n'bass and jungle vibes baby! 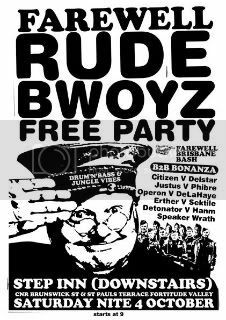 Read more about RUDE BWOYZ FAREWELL FREE PARTY!! Melbourne's Premier Monthly Drum'n'Bass & Breakbeat Event relaunches itself at THE ESPY this Saturday. Got Funk? breaks DJs will kicking off their antics in the mezzanine at 10.30pm.